Pastel drawing on paper, 34 x 25 cm (13.4 by 9.8 in). 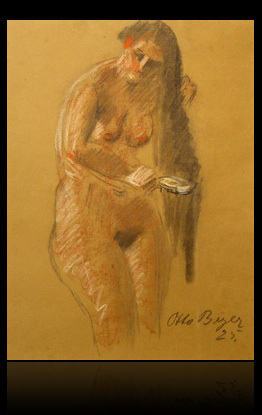 Signed and dated "Otto Beyer (19)25“. Fine and preciously framed gilded gold leaf. Dimensions framed: 58.5 x 47.5 cm (23 by 18.7 in). Provenance: Collection Dr. jur. Walter Sachse, Berlin. Exhibitions: 1909 Berliner Sezession; 1917 Freie Sezession; 1919, 1926 Gallery W.Gurlitt, Berlin. Beyer is a remarkable „Expressionist“ and his interesting work is an exciting rediscovery. Infuenced by the "Brücke" artists, especially Pechstein. He also was a member of the "Freie Sezession Berlin" under Max Liebermann, his mentor and like his Brücke friends was considered "entartet" between 1933 and 1945. Mainly active in Berlin and belongs to the artists of the so-called "verschollenen Generation" (Forgotten Generation), which describes a generation of young German artists born between 1890 and 1905. Artists who didn't have the possibility of continuous working and neither to exhibit consistently, because their lifes and creation was influenced by the difficult circumstances of two World Wars. Mainly of the Nazi Regime, they became victims of the denunciation of '“Degenerate Art“. Their early work was often destroyed or torn apart and so they fall into oblivion. Until several newer publications and exhibitions, which reminded on their first successes, that drawn a wide attention from museums and privat collectors to them. Recently many artists of this generation been revalued and continue to climb in value. They are also called „Expressive Realists“. Literature: Vollmer, vol. V, 1961. OB - text R. Pefferkorn, Ölbilder, Aquarelle, Druckgrafik (paintings, watercolors, prints) exhibition catalog, Berlin 1988; Impartations Walter Sachse, Berlin; Saur, Allgemeines Künstler- Lexikon, vol 10, pp 341-342; Rainer Zimmermann, Die Kunst der verschollenen Generation, Munich 1994; Rolf Jessewitsch, Gerhard Schneider, Axel Wendelberger, Expressive Gegenständlichkeit, Schicksale figurativer Malerei und Graphik im 20 Jahrhundert, Werke aus der Sammlung Gerhard Schneider, Bönen 2001. 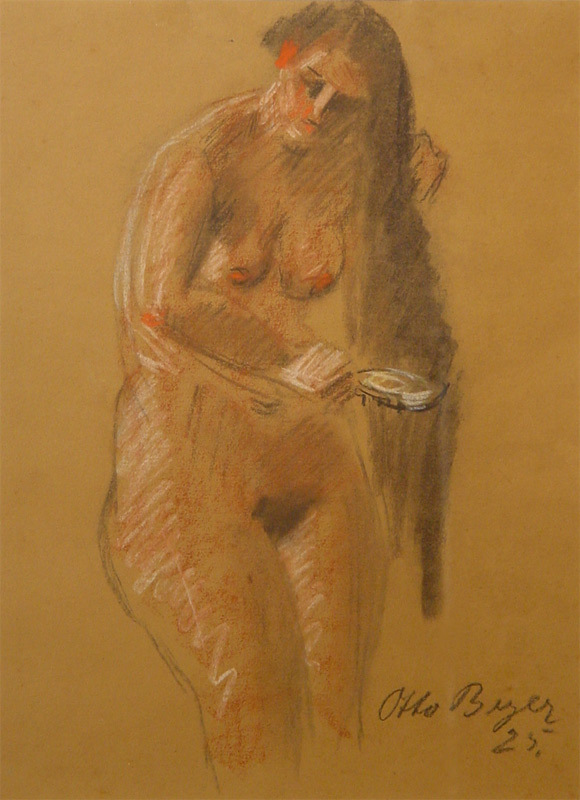 One of five signed and dated aesthetical pastel drawings from the years 1925 until 1945. A most impressive and extremely rare series, which allows a review of his stylistic development from over twenty years of his creation. Fine original condition. Further details and price on request.